Regal but without ego or fanfare, Chef Keiko and her impeccable staff create a spectacular dining experience that is more than worthy of her Michelin star. While one’s credit card balance will definitely take a hit, I found it to be every foodie’s dream and worth the expenditure. 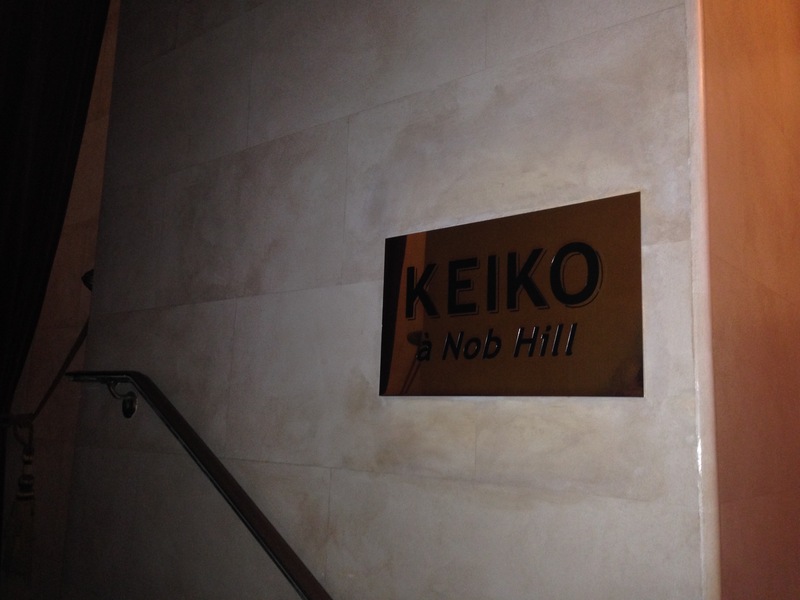 KEIKO À Nob Hill is one of those amazing finds that one either stumbles upon or is fortunate to learn of it through word of mouth. The former was true in my case, as I walked by it several times and learned that it was a $$$$ “sushi restaurant” according to Google Maps. Ummm, not quite. I was intrigued, but I put it out of my mind, until months later, when a few friends and I were researching the Michelin guide to the San Francisco Bay Area and surprise! KEIKO was listed. I knew at that moment I had to try it and immediately made reservations for when one of my best friends (and fellow foodie) was to visit. KEIKO is almost literally hidden. A simple brass placard on the wall of an early 20th century high-rise condominium building is the only indicator to passersby of the gem within. The decor is a bit heavy and dated, not what one would expect to be a match for Japanese fusion. Yet it makes sense given the “old money” feel of the residential building in which it resides. KEIKO has only one nightly seating in its tiny dining room, which adds to the sense of dining in someone’s (extremely fancy) home. If you’re late, you’ll hold up your fellow diners! The meal proved to be sublime. 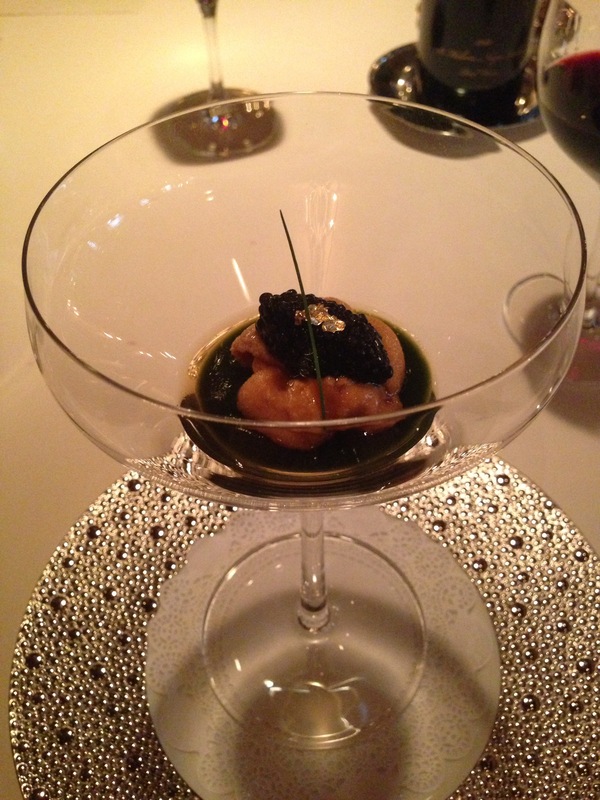 Each dish was deftly executed and presented as if fine jewels or art on a plate. My only gripe was the exorbitant cost of corkage ($65). 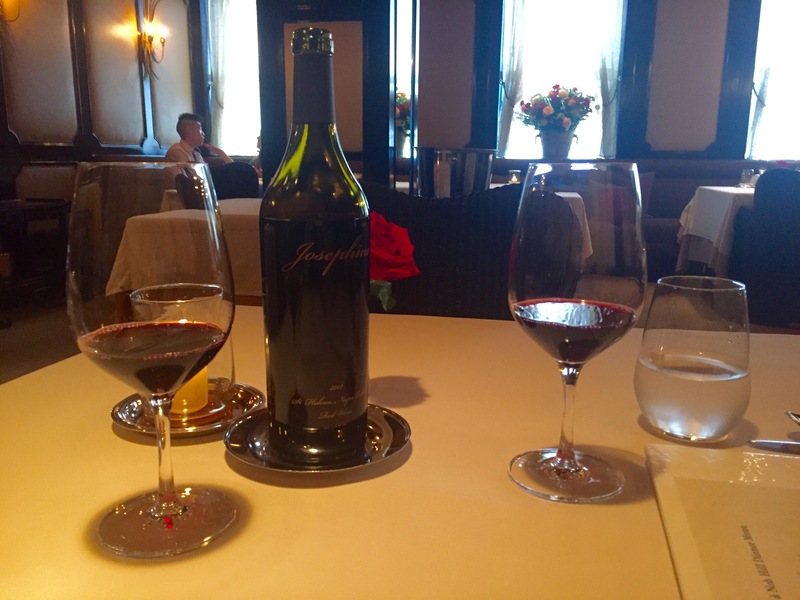 Luckily, our bottle of wine was nice enough to warrant it (Freemark Abbey’s Josephine Bordeaux blend red), but no corkage should cost that much. On the plus side, the staff accommodate dietary restrictions and allergies, calling me three days in advance to check. On to the dishes! First up was Shimaaji, sashimi of yellowjack. As you can see from the photo, it was beautiful. It melted in my mouth. Course two was Uni, or sea urchin, atop a cauliflower mousse and seaweed gelée. It was my first time trying sea urchin. It wasn’t quite so scary – it had a smooth texture and briny flavor, but I didn’t want to tempt fate with my shellfish allergy. 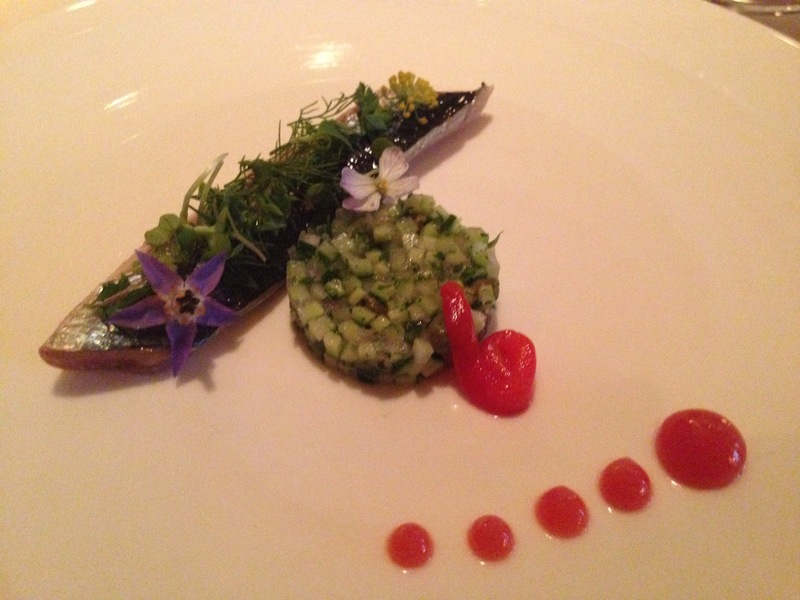 Course three was a fresh, slender Japanese sardine filet, Iwashi, accented with dill and accompanied by a wonderfully refreshing medallion of cucumber salad. Course four was probably my favorite overall. 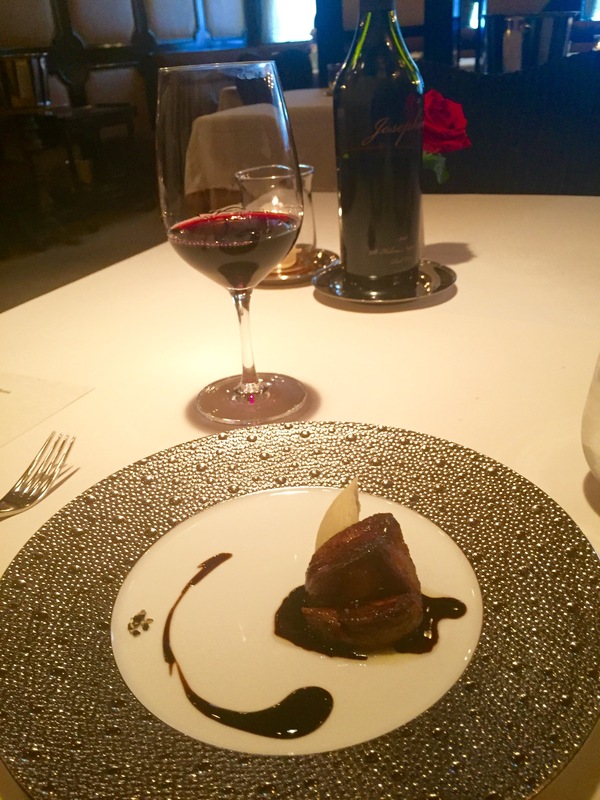 Seared foie gras perched atop a dark, rich coffee reduction – one of Chef Keiko’s house specialties. 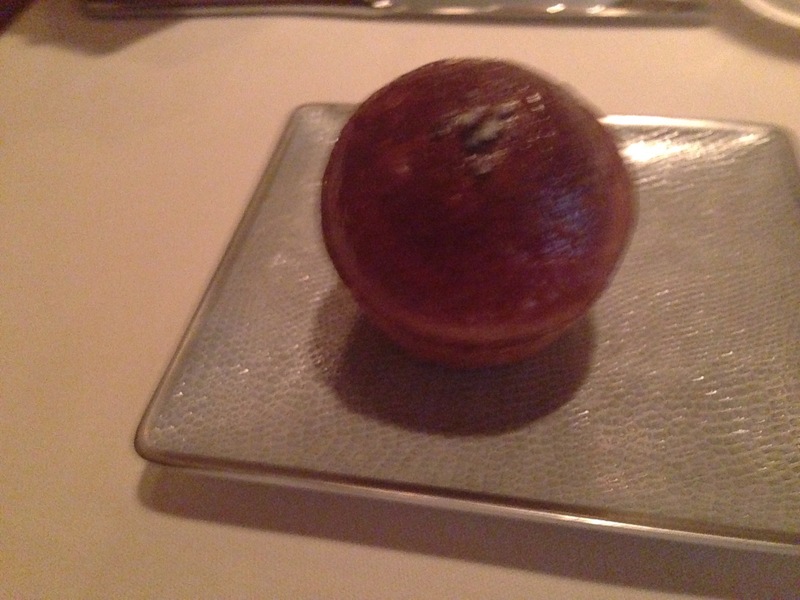 Our server presented us a petite brioche to soak up the delicious coffee reduction. I left nothing behind. 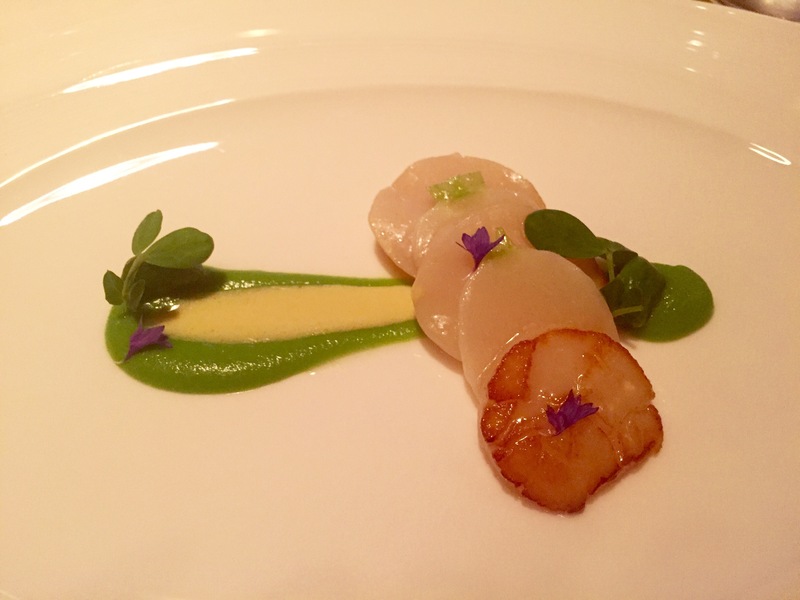 Course five, Hotate, consisted of a single, perfectly seared sea scallop, sliced thinly and accompanied by an unexpectedly rich duo of pea and corn purees. My friend and I reveled in every drop of those purees. Course six showcased Maine lobster two ways, which included a lobster-polenta cake. 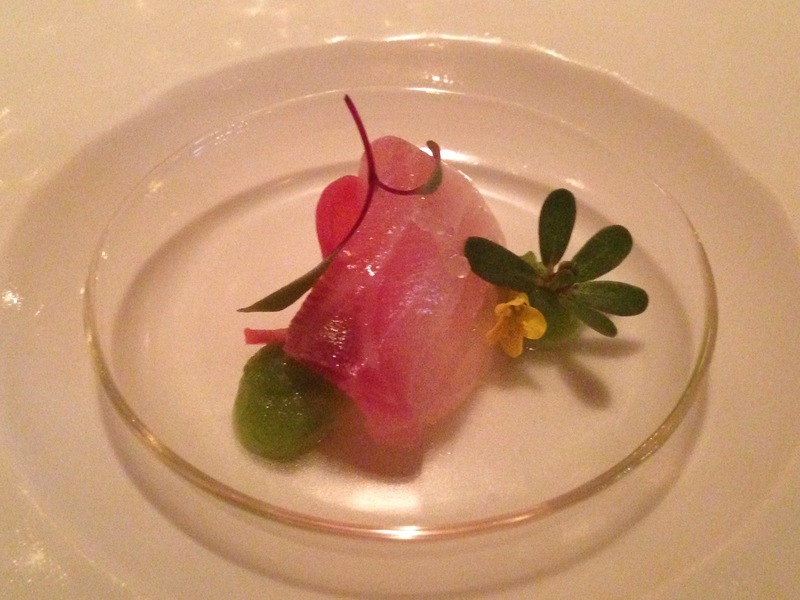 Course seven was our main fish course – a specialty flown in daily from Tokyo’s renowned Tsukiji fish market. Today’s feature was tilefish. 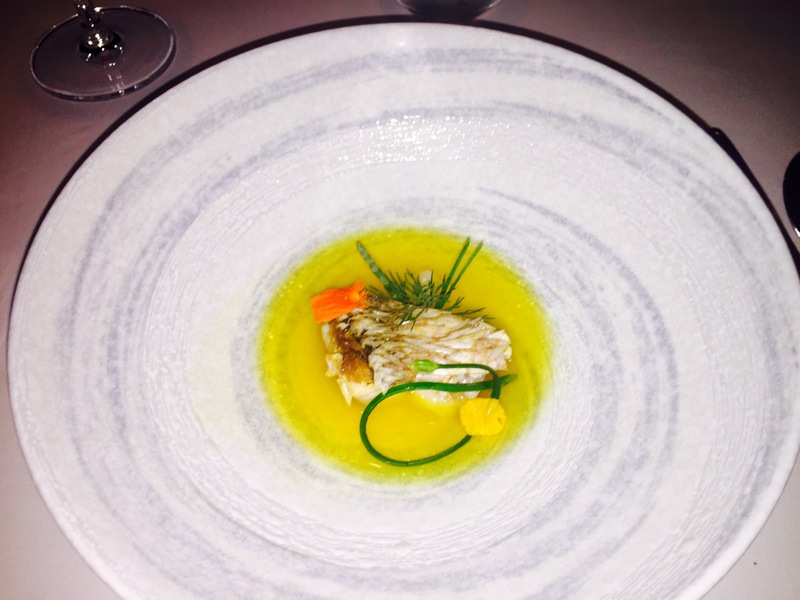 It was served with its signature coral and tile-esque skin and poached in a light, delicate saffron broth with dill and scallions. 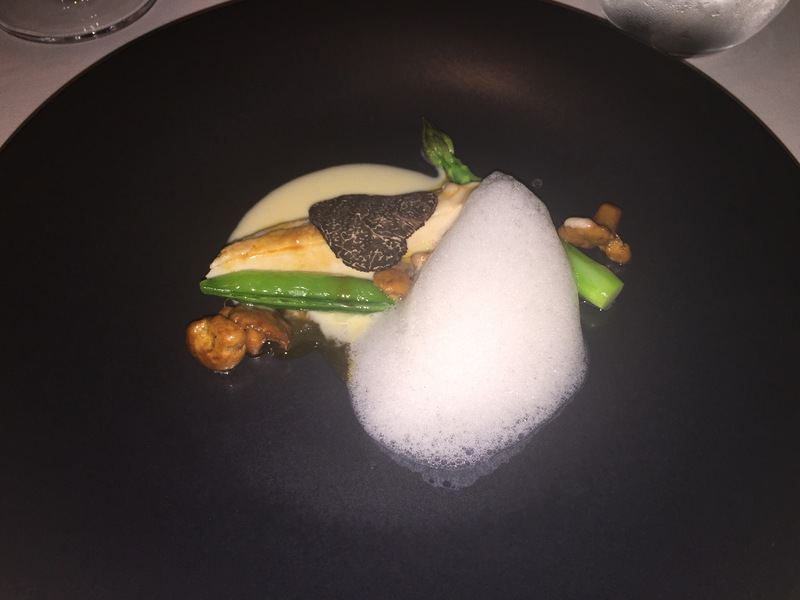 We moved from “surf” to “turf” in Courses eight and nine, starting with Cornish hen, accompanied by chanterelles, asparagus, black truffle foam and a single shaved bit of scrumptious black truffle. It was an elegant, earthy homage to late spring and early summer on a plate. 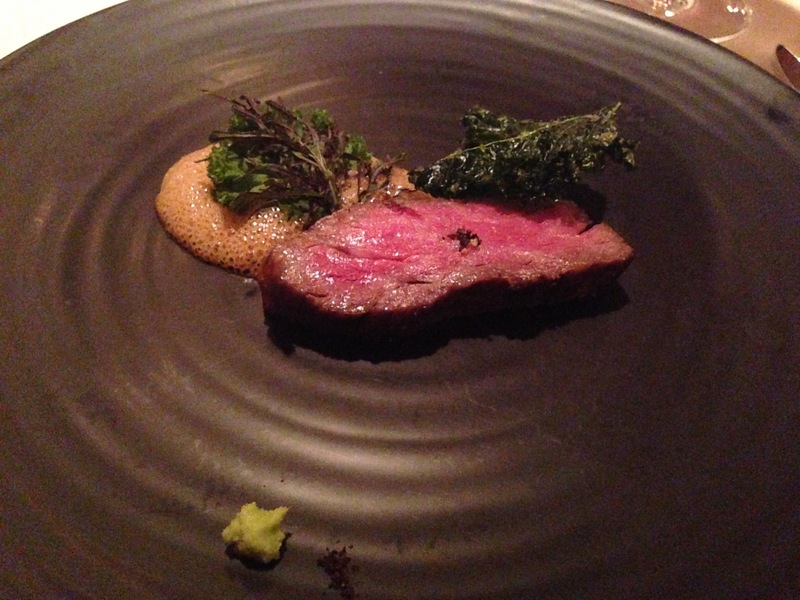 Course nine was a triumphant filet of rare and tender Wagyu beef, its trademark marbling visible yet well integrated. The accompanying yuzu soy foam, black kale chips, and wasabi added a hint of Umami and lightness to balance the heavy richness of the meat. On to course ten and our cheese course. A light, mousse-like cheese managed to be both decadent and light as air, both tangy and delicately sweet like cheesecake. 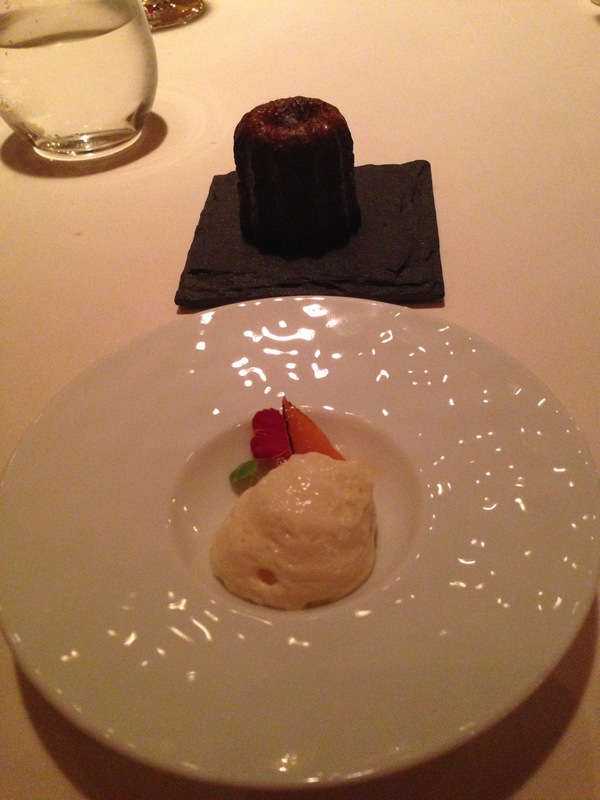 Bordeaux’s signature sweet, the moist cinnamon and toffee delicacy known as the canelé added another counterpoint. Course eleven was the dessert course. Other than the foie gras, it was my favorite of all the courses. Why? I love dessert, but a fruit based dessert must be perfectly executed and novel in order to earn my praise. Chef Keiko delivered indeed. 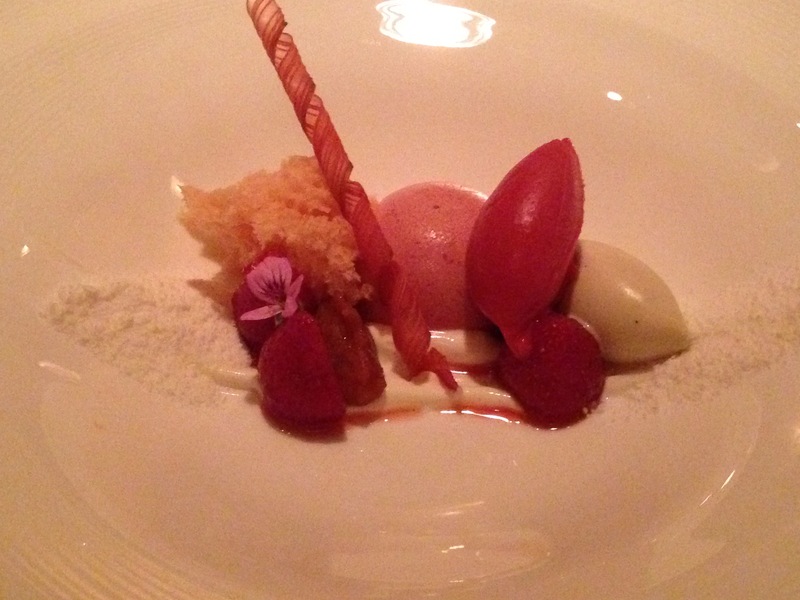 Today’s dessert was strawberry, four ways. Small bites of strawberry mousse, sorbet, and angel food cake, along with a banana mousse and Tart Greek yogurt powder only enhanced the delicate summer sweetness of the berry. And for an added bonus, a thick, lightly sweet-tart, strained strawberry puree was presented in the ornate sipper traditionally served with port. I can’t do justice to this amazing combination in words. 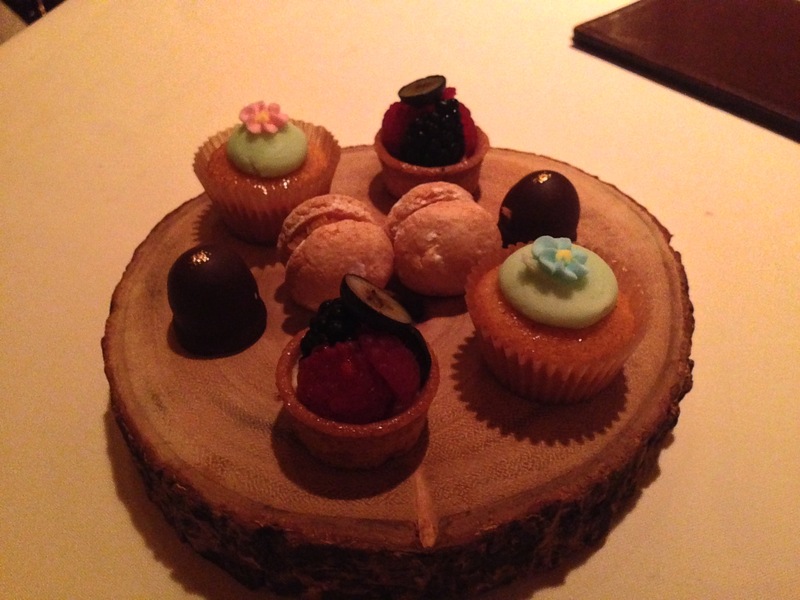 Just when we thought the menu was complete, we were presented with a lovely quartet (times two) of Mignardises – tiny desserts. Hazelnut profiteroles, a fruit tart, a (disappointingly dry) financier, and a dark chocolate hazelnut crunch truffle comprised the sweet finale to a more than outstanding dining experience. As we departed, we managed to meet and effusively praise Chef KEIKO herself. She is a true rockstar in the culinary world. It is truly exciting to see such an extraordinary chef who just happens to be a woman, and my first impression meeting her was that of an exceptional artist, dedicated not to pursuit of celebrity, as some have chosen, but to her craft. For insight into the world of a female chef in the traditionally male dominated world of Japanese cuisine, check out the Netflix Original documentary series, “Chef’s Table” – Season 1, Episode 5, which profiles star Japanese-American Izakaya chef Niki Nnaka and her Michélin-starred restaurant in Los Angeles.